In the very beginning, the Goddess speaks of love in all its various forms. Love brings joy, love builds you up, love creates light and more. There were waves and wave of this vibration that flowed over and within each of us. Love is something that we all seek to have in our lives and it is there more than we sometimes realize. When we arrived in the All That Is, we found ourselves in the amphitheater where the angels and light beings like to speak with us, there is such a feeling of anticipation! There is always a long of beings who would like to chat with us and tonight it was who I affectionately call the 3 M’s: Metatron, Archangel Michael and Melchizedek. Metatron spoke first about how is sometimes referred to as an Angel, Ascended being, Lord Metatron and just himself. He spoke of how the energies are changing and he is aligned with everyone upon the earth and how as the earth is ascending he is aware and supportive. He speaks of how we have the love within us from source that is our foundation. Archangel Michael spoke next and he spoke of his role with humanity has changed over the years. He frequently in the past has been called upon to be the defender of people and the world. He spoke about how this is transitioning as the earth ascends. He also gave everyone a sword of light. He has given people this in the past and mentioned how the sword now used has transitioned from the irons of the past into a crystalline foundation. This is to assist with cutting through what no longer serves and illuminating your life. Melchizedek was the last to speak and he spoke about religions and how so much of that is changing. Each religion has multiple ways in which is it interpreted and that some of that no longers supports people, it was perhaps more negative or controlling through fear. He spoke of the Alpha – Omega society and how that is the beginning to end of all that there is. We each are aligned with the central spiritual sun through our soul. This is our source. There are many, many messages with this channel and the energies of love are deep and abiding. I greet you, beloved family! I reach out from my heart to yours; I reach out to embrace all who are here. All who are here in this now moment, all who are here be it at a later time in your time space reality. This is a place of love. This is a place filled with compassion and energy and light. This gathering that we create together as one is a gathering that is here to support you; to support you in your everyday life, to support you in your spiritual growth, to support you in all that may be flowing within and around you. Tonight I wish to begin this conversation or our time together with the flow of love. Have a sense in your mind’s eye of feeling every breath that you take in as if it moves directly into your heart center and from your heart center it moves it up and down through your energy bodies in and out through all that is within and around you. Love is the foundation for change upon the earth. Love in its purest form creates in a magnificent way. Love is present in everything that you do. Love is compassion. Love is the expression of you when you are in your place of happiness and joy. Allow love to come into your life. I invite you with those words, while you are still here in your physical reality to have a sense of letting them wash over you. Everything has a vibration, the vibration may be something that lifts you up, it may be something that pulls you down; it may be something that creates distraction within your life. Vibration is also something that can transform and can transition; sometimes very easily or sometimes with the deep focused intention. I would, therefore, say to you to invite the vibration of love to be with you throughout your life. Breathe into your heart and send a beam of light; you feel it as it goes through you all the way down into the earth. As this beam of light moves through you, it is activating your energy centers so that they may find their own balance. As that beam of light encounters the earth, it spreads out, moving in many directions. This anchors you here upon the earth plane. You then send your energy back up through you; it activates those upper energy centers and goes out to the top of your head linking with your higher self. Your higher self is that blend of you the human with you the divine. As you feel your own energies flowing through you, you have that anchored energy from Gaia that is also allowing you to expand more fully into the space of your higher self. Look around, it may be as if from within your imagination you are looking around. As you do so, have a clear intention of opening up to feel the energies or the essence of what this may be. It may be that you have no specific sense like it is just a blank space. It may be that sometimes it just looks or feels crowded, full of energy. Allow yourself to let that wash through you. You can clear it out ~whew~ then whether you know or don’t know, you can shift whatever energies may be there. You send that focus of your consciousness so that it moves from your higher self into your divinity. As your consciousness blends with your I AM presence you are opening up to your soul, you are opening up to source, you are opening up to the full richness for who you are. As I spoke of love at the very beginning, this is where all the love, all the source of love originates within you. For some it may be as if that blending immediately occurs, for others it may be as if you are opening up doors and you find yourself merging. Howsoever you choose to connect, allow this to be who you are and what it may bring forth for you. Feel love wash over you. Feel as if you are stepping into a place where you are fully embraced and accepted for who you are. I the Goddess move in and amongst each one of you. I reach out to embrace you in this now moment as our energies merge with one another, you transform into the space of the All That Is. As we arrive within this space, we find ourselves once more in that amphitheater. We have been here many, many times throughout the years. I wished to come into this space at this time because there are some of the Angels and the light beings that would like to speak with you. I invite you to, first of all, take a moment and feel your own energies as they are; feel as if you open up your heart in this now moment to be able to have a direct communication from those who are here. Whenever we get together in a gathering and there are the Angels that would like to speak, it always makes me smile because there is a long line, they love to come through and speak with you. Therefore it may be that some of you will work one-on-one with someone different than who is speaking in this forum. Greetings my beloved brothers and sisters! I have wanted to speak with you for quite some time about the transformations taking place upon the earth. So many of you have felt as if you were stuck in limbo. You have felt as if you are in a cycle that goes around again and again and again and indeed your cycle of incarnating, crossing over, and incarnating has been as if it is an ongoing cycle for you. Sometimes people are able to ascend off of the earth, which is to get out of that cycle and move to a different level of consciousness. Even in this regard, you will have those people who say they are still in the same cycle but just a different space. Therefore one of the things that I wish to speak with you about and that I have asked the Goddess to be able to speak with you about is about your belief system. What is your belief system? Do you follow whatever it is that you might lead are hear? Do you go inside listening to your intuition when you see something and then either agree with it, disagree or let it go? Do you feel as if you are an individual with your own soul, your own intention, and your life that you are living and experiencing? As you consider that this is where your belief system may truly transform. For those of you who have been upon the earth in this one lifetime for 40, 50, 60, 70, 80 years you have seen some very dramatic changes in the earth’s consciousness. That which was the reality when you were a child most likely is quite different from the reality of the earth at this time. However, you can still find the pockets that are stuck in the old energy. This is where you hear about all the negativity. This is where you hear about the things that are happening be it warfare, corruption; there are many things that were hidden that are now coming to light. There are many things that were always there; however, people turned a blind eye. I guess that would be the same thing; however, it is different when you consciously know something and you choose to do nothing about it vs. a potential out there that you don’t fully know or understand. These changes that are taking place are peeling away the layers that have kept people subdued or submerged or in a place where they were not usually used to thinking for themselves. I speak of this in a worldwide situation; there are some that have always been very independent thinkers. I therefore speak of that which is a wave that is moving through all of humanity and through all of the billions of people upon the earth. I Metatron am someone that you can talk to. I am someone that is working directly with many the beings upon the earth. This is why I wish to take this moment to speak with you to let you know how much is going on behind the scenes. Sometimes through people’s unconsciousness, sometimes through the waves of energy that are exposing that which was hidden. I wish to therefore take this moment with each one of you asking you as you are here in the space of your soul and your divinity to breathe deeply into who you are. Allow to come up from within you an image or a sense or a feeling of who you are as your soul. For some, you may see yourself as if lifetimes in the Crusades, for some as a simple farmer; for others the scientist, the doctors or the Healers. There are literally millions of potentials for who you have been and who you can be. I wish for you in this now moment to know that you have so much more potential than what you recognize. As I tap into each one of you three times over the third eye, I do so with a clear intention of activating your third eye that you may see yourself with the truth that comes from within your soul and within you. Peel away the layers, peel away other people’s belief systems, peel away the overlay until you get to you. This is why the Goddess has you come into your divinity and then spend time here in the All That Is. This is your authentic self. Let it wash over you, let it speak to you; let it align with you on every level. Greetings, it is I, the one known as Archangel Michael. Many of you know me and have worked with me, especially through Shelly, for many, many years. I have placed myself at the forefront for the past 50 years with the intention of assisting with my sword of light and energy cutting through the old paradigms. I am known as the Angel of protection, indeed I am here to protect you in any way that you may need. I have legions of Angels and light beings who work with me. I am here to cut through the energies of the old so that the high vibration and the crystalline energies may flow within each one of you and the civilizations of the earth. As we move into this next phase of evolution upon the earth there may be different star beings that will come into your reality. In everything, I invite you to understand what is your truth in any given situation. If you would like, you may hold out your hands and I will give you your sword of light. You may have already received one from me, I, therefore, recalibrated for where you are right now. If this is the first time that you receive one, may you know that as soon as you take it into your hand this sort of energy and light is aligned with you. It is balanced for you. You may wonder when to use something like this. First of all, from here forth it is always in your energy field. If you, therefore, seek to get to the bottom of something as if you have that roots, and you take that sort and you cut through the roots. It is there for you. If you are wondering what is the truth of a situation, you may take that sword and ask to know what is the truth. It will cut through any lies, it will cut through any distractions allowing you to see or understand that which is yours. As you move away from the third dimensional energies as most of you have already done so there is less of a need for a sword of protection. You are now transforming into the sword that reflects the crystalline vibration of the new energy. Allow your sword to be your truth. Allow your sword to be your reality. As I transform you will hear more and more people speak about channels with me and speak to many, many, many different people. I do so because there are so many interpretations of the vibration and the energy. Therefore recognize that if something is different it is because that vibration or information is needed for perhaps a different group of people or energies. And always I invite you to believe in yourself. Know that the deeper you go within soul and source the deeper your alignment will be therefore assisting you with everything happening within your life. I am always with you and I thank you for this opportunity. Greetings, indeed I am the one known as Melchizedek. Shelly is in the background smiling and laughing because for many years she would channel the 3M’s: Metatron, Michael and Melchizedek: or she would call us Met, Mike, Mel; or something like that! We three have been a part of the earth’s energies in support of humanity from the very beginning. We all work in different ways with humanity. We are all here ultimately in support of you and ultimately to assist in whatever the evolution is that is taking place upon the earth. There are times when you look back and the ancient times when experiences took place in certain cultures had a prominence that began with a particular intention, however over the years became corrupted and different. I have been associated with many of the religions upon the earth and this is in part of which I speak. People have always wanted to have something that they could look up to that would guide them. In religion, there was that version of God. Some religions a very strict and consider God is a vengeful Lord. Some religions consider God as the soul within you. Some religions consider God as the Almighty that is judging everybody. Over the years these various branches of been created as a means of what society needed at any given point in time. The Alpha Omega society was created as Alpha the beginning and omega the end and the society that wove together everything in between. This is back when there were the gods on Olympus, this was during Atlantis, the Roman times; in almost any piece of your history, you would find bits and pieces of this. I am therefore here at this time in history because the truth and the reality that is coming forth is that God begins within you. God is your source energy. God is that link that goes to the central spiritual sun. God is always something or someone that begins within you and expands into immensity. As you move into the fifth dimension the foundation is love. Therefore, anything about God or religion is based on love; love that supports you and nurtures you. Love that enriches your life, love that helps you to understand that there is more than just this now moment, there is the infinite wisdom of the universe. And that which was referred to as the God Almighty is the infinite wisdom of the universe which is accessed through you as source. Understand that as these transformations continue to evolve that love and God and source is about the Enlightenment, the awareness, the acknowledgment; the foundation for everything is love. It is through love that you are supported, that your life is an enriched, that you change or transform through compassion. The building up that comes from within you as opposed to the breaking down that comes from outside of you. I Melchizedek have been here throughout the ages. I have been interpreted in many, many different ways and I ask you to open up to receive my message of love and spiritual growth in a way that supports you completely. I the Goddess walk with you once more. There are as always many others who would like to speak however I will keep it to the 3M’s this evening. Sometimes I wish for you to experience these meditations and these vibrations from some of these other sources that are here in support of you. If there is anything that might be niggling at you or bothering you in any way then I invite you to let it come up from within you in this now moment ~whew~ clear it out. Clear it out knowing that you stand on this threshold ready to move to that next level of whatever that may be. I invite you to open to love. I invite you to open to happiness. I invite you to open to the potentials not only that are here for your life but are here for all of humanity. If you find yourself in struggle or trauma or hurt I ask you to take a deep breath in feeling these three energies as they surround you and as I amplify your own divinity within you; breathe in love. If you have belief systems that you have had for a long time and they support you and in which you and help you to feel better in every way then allow that to flow through you. It is only when you find yourself waffling without that support, in a state of fear that these energies can much more fully support you and enrich all of your life experience. As I said at the beginning, love is these many, many different expressions of you is humanity, of the Angels and the light beings, as what they are – many of them have walked upon the earth. These three who have spoken to you have all walked upon the earth at one time or another. There are many Angels who have never walked upon the earth. However, they can still give you the compassion and the support that you may be seeking. You are the one living your life! You are the one with the history that makes up all of what this is. Know that you have infinite source energy at all times. I am but the reflection of the universal light, the universal love that which comes from the central spiritual sun, that which comes from the center and soul of the universe. As I am love, you are love! I invite you to gather together as a group. As everyone forms this circle as you come together understand that surrounding you with an outer circle are the many different Angels and light beings. As they fill this space and support you, you see coming up within the center of the circle the hologram. This hologram is filled with the energies that have shifted and transformed. It’s representing what the earth itself is going through; as you infuse that deeper connection that you have to source. Into this, you infuse love into this hologram. It is being reflected back and amplified by all the Angels and light beings who are here. The hologram itself fills with energy and light. As it does so it begins to spin and rotate and the light that is reflected out from within the center may have multiple colors. As the group lets it go, there is that sense of it moving into directions. There is the part that goes out into the universe creating universal balance. It goes down into the earth moving through the collective consciousness of the earth as it clears it out. It goes down into the center of the earth anchoring within the core essence of the earth itself. It comes up expanding out, it comes up through the rocks the grass the trees the water. It clears out everything through which it comes up within each one of you, your own transformation is anchored within the earth and then comes up through that anchor that you had already placed within the earth and settles into your heart center. It moves outward, so that you can clear the energies coming down from the universe and then you clear the energy coming up from within the earth. This is letting go the old paradigms, this is clearing out as Michael uses this sword of light and truth clearing out that which no longer supports you, opening up these energies so that the world can move into their own awareness of source and love that is within them. As this continues to clear and rebalance everything you bring back the rest of your own soul and essence. You let it come back through the soul plane, it comes through your higher self, and it streams back down anchoring within you in this now moment. I invite you to sit quietly with these energies. Feel that sword of love, that sword of light that you received from Michael. Understand the big picture as Melchizedek spoke of it. And know that everyone is connected through Metatron and he is here supporting the world and supporting humanity. Love is the foundation for everything! If you find yourself outside of love, then breathe deeply having the clear intention to bring your energies back into the vibration of love. As you are living your life upon the earth, I invite you to remember that your life begins within you. It’s you as you are in this lifetime, it’s your alignment to your own divinity, it’s your grounding the energies into the earth plane and then it’s the reflection of all of that outward from you. Remember to let go anything that pulls you down or makes you feel bad. Remember to let go of anyone else’s negativity or bad vibration or lower vibration. 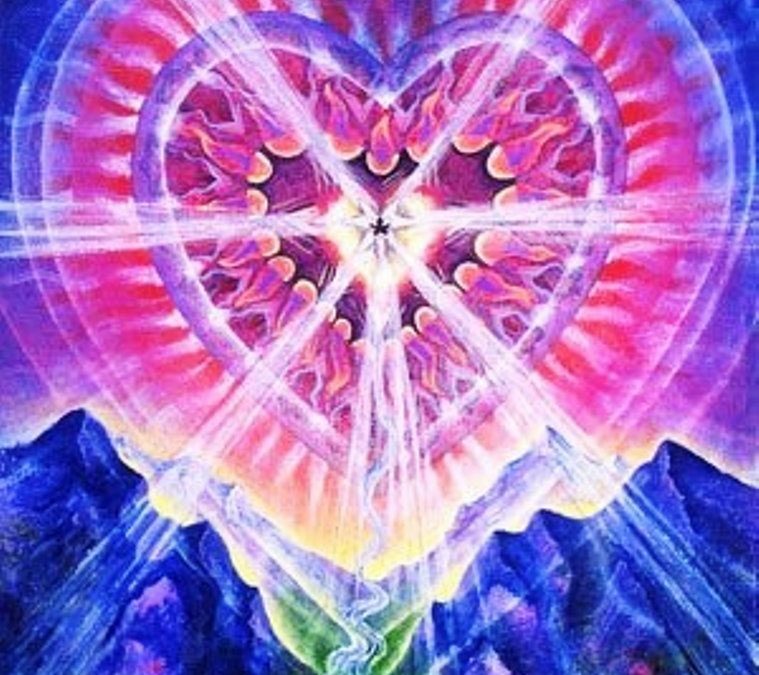 Remember that you are moving through this process in everything that you are doing and the end result is about living your life through your heart center, living your life through love, living your life with everything around you reflected with the vibration of love. You’re welcome!! I appreciate all of your comments and I’m glad that they resonate with you.